Good morning! We’re almost at the end of the week – is anyone else feeling like they’re going to need a whole lot of caffeine to get there? Is anyone else feeling a little freaked out that tomorrow is Friday the 13th? Ok, so most of you are probably miles more mature than I am, and aren’t concerned about tomorrow in the least. I bet a lot of you are with me on the caffeine thing, though! 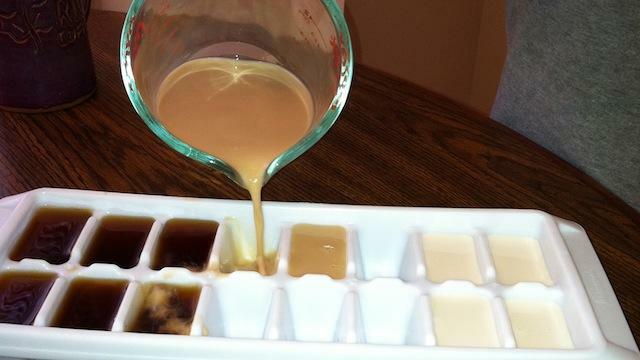 I’ve heard of adding frozen coffee cubes to iced coffee, to keep it cool without watering it down, but the folks at LifeHacker.com suggest adding them to hot coffee, to keep you from burning your tongue first thing in the morning! It’s genius! I especially like how they added flavour shots to some of them. Have a great day everyone! In the meantime, I’ll try to find a video to help us – ok fine, help me – from feeling too superstitious tomorrow!